UAH global temperature for June 2012: up slightly | Watts Up With That? I have to update the WUWT sidebar widget manually, since the fetching code has failed on it…I’ll do that tonight. July 6, 2012 in Climate data. After running above last year’s temperatures since early March, they have now dipped below for the last couple of weeks. Look for July to be under 0.30C again. Interestingly, while the media blames the current heatwave on Global Warming, we are seeing some of the most active solar flares in quite some time happening this week. CO2 hasn’t dramitically gone up this past week, has it???? Hopefully somebody out there is watching the Sun. Roy, a favour please: Write El Nino above 2010, to be up to date…. Can someone tell me where to get hourly temperature data for a given day/month/year for Philadelphia Pennsylvania? Appears not to be free anywhere. I’m paying for those airport thermometers, I want the data. Having just been noticing how much summer-winter temperature swings increased in arctic ice plots recently, it is noticeable such has been happening globally too in the most recent years if one looks closely at the UAH plot. Some of ENSO-related effects may be tending to be around 4 years apart, perhaps being in part a 4 year ocean oscillation aside from other oscillations and solar related effects on top. 2010 had major warming from such. 2006 and 2002 probably did. 1998 obviously did. If so, the next would be around warming up through 2014. Plus the solar cycle hasn’t completed its peak yet. Given that the 4th order polynomial fit … should not be construed as having any predictive value whatsoever, if there was such a thing as a climatist WITHOUT and agenda — but with a conscience and a pinch of honesty — he would say that a descent into decades of global cooling is not necessarily imminent butnit is VERY LIKELY and in any event in saying this we do not mean to connote a danger to humanity because of it — or however it goes — because… we just dont know–i.e., we could all be doomed but that is just NOT VERY LIKELY and certainly not based on anything we can point to like a graph or forrest fire. However, perhaps with more funding we can be less positive. Roy, if you know anything about statistics and probability theory you would know that you can be 99.5% sure from my results on a random sample of 45 weather stations that global warming stopped somewhere in 1994. Your results off late showing an uptrend do not make sense. I would check the sensors? The nature of the relationship that I find between the warming and cooling of the earth over the past 37 years is binominal (parabolic), indicating a natural process. At the end of the day, it is clear (to me) that the cooling and warming component caused by an increase/decrease in CO2 /H20 has cancelled each other out. Whether that natural process of warming/cooling involves the sun-UV-ozone factor, is what I am still trying to figure out. So just 0.37C above “normal”… that’s it? All this hullaballoo over climate change because of a fraction of a degree change in an arbitrary normal value. If you look at the sinusoidal curve, it looks like its starting to fall too. This would be in line with what Corbyn and Bastardi and others have been predicting, with global temperatures falling to LIA levels. The next point should then be lower but hopefully the North-West will stay warm and dry for July and August… fed up with cold and wet weather! select hourly. go to the map. It appears that for the last two years now the monthly temps have been diviating significantly from the average months of the reference period. There is a clear annual cycle in the “anomalies” that shows increased seasonal variation in the NH is dominating the global mean. The lesser inertia of NH would probably cause its changes to be larger and to dominate any such change in behaviour. In particular cooler winters make deep troughs. Since most of the warming was caused by warmer winters I would suggest this probably a clear sign that we are entering actual cooling returning to a pattern that predates the satellite record shown here. The middle plot of that panel of three shows rate of change fitted to three cyclic terms plus a linear rate of change. The fit shows rate of change crossed zero in about 2008 and has a small negative value (cooling) for the last few years. Interactive temp graph is no longer on the Discover site. Gone forever? So post-2014 would be when cooling seems likely. For all the reasons you state it may be a bit later than 2014 before the cooling hits hard. The graph I linked above http://curryja.files.wordpress.com/2012/03/icoads_monthly_adj0_40-triple1.png suggests it will be near 2020 before it really kicks in. Then we could be seeing cooling on the scale of the warming of 1920s and 30s. Luckily we’ll be starting from “unprecidented” highs but it looks like cooling will be rude. Given that the accuracy of any global index is probably at least 0.5°C (unless someone wants to share a proven, calibrated and verified error analysis) it all is wash in the noise. If you look at the sinusoidal curve, it looks like its starting to fall too. This would be in line with what Corbyn and Bastardi and others have been predicting, with global temperatures falling to LIA levels. You mean the curve that says “for entertainment purposes only”? Apparently, you are enjoying the entertainment! I have a suggestion for you, instead of fitting a 4th order curve to the data, try a 2nd order one. It has an upward curvature and would predict the temperature anomaly will be ~1.37 C by 2046. While neither fit is likely to have much predictive value, I’d be willing to bit that the latter one will be much closer to the truth than that of the 4th order fit or any fantasies of Corbyn and Bastardi. This is from the NWS. 98 in 1881? The list I got of record highs in Columbus in 2007 and 2012 both say the old record was 95 set in 1925. Things that make you go, “Hmmmmmmmm”. JJ where? The link in the menu on the left at their main page isn’t there. If it wouldn’t be too much trouble, I would like to see that 2nd order graph. joeldshore: While neither fit is likely to have much predictive value, I’d be willing to bit that the latter one will be much closer to the truth than that of the 4th order fit or any fantasies of Corbyn and Bastardi. Well that’s your “fantasy”. Any reason we should give that any more credence than two guys who actually have a reason to hold the opinions they do? Why would you want to fit a quadratic to the rising 30 year part of a 60 year cycle and extrapolate forwards. This is mistake/fallacy upon which Hansen’s now seriously failed 1998 senarios were based. The ensueing decade of observations has shown those predications to be wildly off. What reason do you have for still subscribing to that fantasy? BTW I agree Spencer’s “entertainment” polynomial is pretty dumb. He posts it with a disclaimer knowing full well most people will ignore it and see it as predictive. Maybe he should fit a spline, then no one would know where it would go next. I agree it’s rather stupid to put an “entertainment polynomial” on a graph that should be unbiased scientific data. Leave the polynomial and your views out of your data products. Doug: What about a pure 21 Cty average horizontal line, starting 2001? Sure…Go to http://www.frontiernet.net/~jshore/ and click on the “UAH LT data and fits” link to open up an Excel file that includes the UAH LT data with various polynomial fits and a graph of the data and fits. Why would you want to fit a quadratic to the rising 30 year pk art of a 60 year cycle and extrapolate forwards. This is mistake/fallacy upon which Hansen’s now seriously failed 1998 senarios were based. I don’t normally defend Hansen or his ilk but let’s be fair here. In 1988 Hansen gave 3 scenarios – all of which generally predicted warming. We most certainly have had warming. You can argue that the warming is not as great as that predicted by Hansen (given the CO2 emission levels) but you cannot deny warming has occurred. We have read of a number of “anti-AGW” predictions which predict cooling (from 1998, 2003, …etc) – none of which has yet been shown to be correct. We have just had back to back La Nina events – and weak solar activity – yet UAH anomalies remain at the elevated levels they have been over the past decade. Anomalies during the recent La Nina were higher than during the 1986/87 EL NINO which happened to be during the strong 21 and 22 cycles..
Don’t forget also that Solar Cycle 23 was not a particualrly strong cycle . 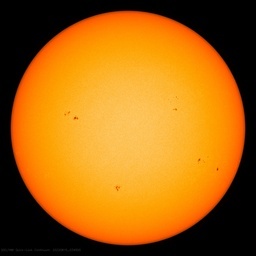 The sun hasn’tbeen particularly active for about 20 years. There is no cooling in evidence – yet. On the contrary, I suspect there is still quite a strong underlying warming trend which will become more evident as the lagged effect of La Nina fades. Further reinforcing the obvious sine wave shape for the smoothed signal. The atmosphere above land is getting warmer in the summer, but not in winter. Likely cause is increased insolation from decreased clouds (and aerosols and aerosol seeded clouds). The same effect is also causing Arctic sea ice melt, south facing (but not north facing) glacier retreat, and the satellite – surface temperature divergence (surface temperatures are derived from min/max and surface minimum temperatures are particularly sensitive to solar insolation changes, whereas satellite temps are not). Although the satellite-surface divergence has disappeared in the last 3 or 4 years. I’m not sure why. Could be natural variability. Could be a solar effect. Could be an artifact of globally averaging a local and regional phenomena (aerosols). Thanks to Dr. Spencer, as ever. 2012 started off rather cold but has warmed up since then. So the present rank is not be the most meaningful number. Therefore I will also give the ranking by assuming the latest month’s anomaly will continue for the rest of the year. With the UAH anomaly for June at 0.369, the average for the first six months of the year is (-0.089 -0.111 + 0.111 + 0.299 + 0.289 + 0.369)/6 = 0.145. If the average stayed this way for the rest of the year, its ranking would be 10th. This compares with the anomaly in 2011 at 0.153 to rank it 9th for that year. On the other hand, if the rest of the year averaged at least the June value, which is more likely if the El Nino gets stronger, then 2012 would come in at 0.257 and it would rank 3rd. (1998 was the warmest at 0.428. The highest ever monthly anomalies were in February and April of 1998 when it reached 0.66.) In order for a new record to be set in 2012, the average for the last 6 months of the year would need to be 0.71. Since this is above the highest monthly anomaly ever recorded, it is virtually impossible for 2012 to set a new record or to even come in second. With the GISS anomaly for May at 0.65, the average for the first five months of the year is (0.34 + 0.41 + 0.47 + 0.55 + 0.65)/5 = 0.484. If the average stayed this way for the rest of the year, its ranking would be 10th. This compares with the anomaly in 2011 at 0.514 to rank it 9th for that year. 2010 was the warmest at 0.63. The highest ever monthly anomalies were in March of 2002 and January of 2007 when it reached 0.88. If the May anomaly continued for the rest of the year, 2012 would end up 4th. With the Hadcrut3 anomaly for May at 0.474, the average for the first five months of the year is (0.217 + 0.194 + 0.305 + 0.482 + 0.474)/5 = 0.3344. This is about the same as the anomaly in 2011 which was at 0.34 to rank it 12th for that year. 1998 was the warmest at 0.548. The highest ever monthly anomaly was in February of 1998 when it reached 0.756. If the May anomaly continued for the rest of the year, 2012 would end up 9th. With the sea surface anomaly for April at 0.292, the average for the first four months of the year is (0.203 + 0.230 + 0.242 + 0.292)/4 = 0.242. If the average stayed this way for the rest of the year, its ranking would be 14th. This compares with the anomaly in 2011 at 0.273 to rank it 12th for that year. 1998 was the warmest at 0.451. The highest ever monthly anomaly was in August of 1998 when it reached 0.555. If the April anomaly continued for the rest of the year, 2012 would end up 12th. With the RSS anomaly for May at 0.233, the average for the first five months of the year is (-0.058 -0.121 + 0.074 + 0.333 + 0.233)/5 = 0.0922. If the average stayed this way for the rest of the year, its ranking would be 16th. This compares with the anomaly in 2011 at 0.147 to rank it 12th for that year. 1998 was the warmest at 0.55. The highest ever monthly anomaly was in April of 1998 when it reached 0.857. If the May anomaly continued for the rest of the year, 2012 would end up 11th. So on all five of the above data sets, for their latest anomaly average, the 2012 average so far is close to that of 2011. If present trends continue, 2012 will be warmer than 2011, but a record is out of reach on all sets. It is good to know that Columbus had an international airport 22 years before the Wright’s first flight. Not much microclimate site change since that time, what do you bet? It seems there have been lots of changes here. Including what was written down in years past. BTW The Weather Channel said this morning that the record was set in 1911. I don’t remember what they said the old record was. Broken records are beginning to sound like broken records. Just change the golden oldies to whatever suits you. Better yet lets simply look at the acceleration of UAH temps and note that they are decelerating unlike warmist predictions. This is also clearly the case for global temps best proxy sea level rise. Therefore instead of obsessing over linear trends lets remove then and see whats left. This chart shows it better. The long-term rising trend is intact, and there is no unusual acceleration due to the ≈40% rise in CO2. If rising CO2 made any measurable difference, then that large increase in CO2 would have caused the recent end of the chart to show rapidly accelerating temperatures. But it doesn’t. This Wood For Trees chart shows the same thing: no acceleration in global temperatures, which remain within their long term parameters. Here is another look at global temperatures, within their long term parameters. And here is another view of long term global temperature anomalies, with a normal y-axis. The planet is still recovering from the LIA, so naturally temperatures are going to be warmer now than they were a hundred years ago. But if CO2 had any measurable effect, we would certainly see an accelerating temperature trend. Since that is not happening, the conclusion is inescapable: the effect of CO2 on global temperatures must be much smaller than claimed. Thanks. I had a look at all of those fits. There is not one there that fits with a correlation coefficient of more than 0.4. That is too small. It all looks random. It means you cannot do anything with those fits in terms of prediction. In fact, looking at those results, I would say there is something seriously wrong with them. Something is not right. it has a correlation coefficient of 0.995. In fact, after adding Reagan airport, it ramped up to 0.996. It shows me earth is cooling and you can be at least 99.5% sure about that. The global average lower tropospheric temperature anomaly for June (+0.37 °C) was up from May 2012 (+0.29 °C). … turning around the world’s fossil-fuel-based energy system is a truly gargantuan task. That system now has an annual throughput of more than 7 billion metric tons of hard coal and lignite, about 4 billion metric tons of crude oil, and more than 3 trillion cubic meters of natural gas. This adds up to 14 trillion watts of power. And its infrastructure—coal mines, oil and gas fields, refineries, pipelines, trains, trucks, tankers, filling stations, power plants, transformers, transmission and distribution lines, and hundreds of millions of gasoline, kerosene, diesel, and fuel oil engines—constitutes the costliest and most extensive set of installations, networks, and machines that the world has ever built, one that has taken generations and tens of trillions of dollars to put in place. We really need to start seeing more months in the negative. Otherwise, the solar theory isn’t going to look so good…. I would have to agree with most of the other critisms against the “entertainment polynomial” as well. Even with the discalimer I was using it to judge where temperatures were heading. The temps are definetely going up, just not as fast as the alarminsts predicted. There is no need to “entertain” the idea that they are heading down. Just let the facts speak for themselves. Most skeptics understand that added C02 does increase temperature over time. To what degree is still uncertain. The correct trend line should be +0.1 deg C per decade, no? Or are we calling a top for the recovery from the LIA? Roy – That “entertaining” line represents your intepretation of the data, like it or not. If you have a better line, then use that. If you don’t have a better line, then people will think the a leading expert in the matter has stated a view. The problem is, if the anomaly remains at +0.3 deg C, then it is falisifying your implicit forecast: the gap between the data and the line will continue to grow. It’s just the reverse of what has happened to Hansen. So the global June temp. is .05 warmer than it was last June. We can have high correlation coefficients which have more power than a negative trend of some more months. There is no theory, and because of this, there is no need to reject any. 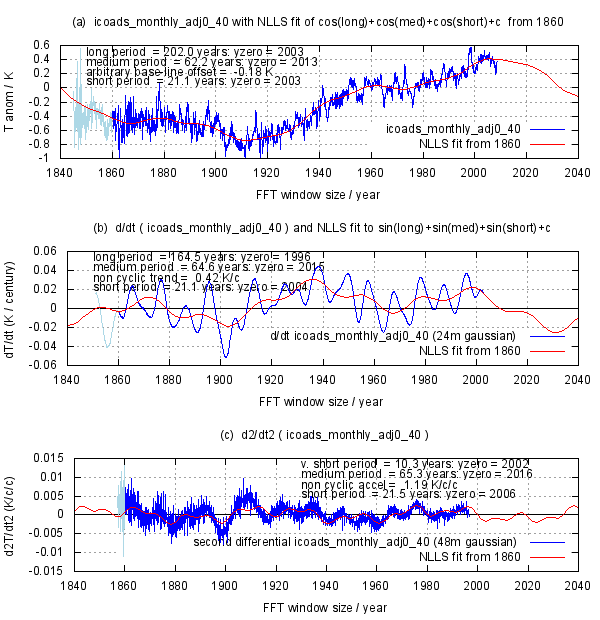 *) There are phase coherent data from global sea level oscillations and solar tide functions. Interactive temp, graph is no longer on discover site, Gone Forever? No, Still there but very hard to find, took me quite a while to find it and still don`t know how I did it. Most skeptics understand that added C02 does increase temperature over time. Count me out, please. With all the results on the table I am not even sure if more CO2 has a net warming or a net cooling effect. Ok – most skeptics who understand basic atmospheric physics understand that added C02 does increase temperature over time. John, you cannot make a statement like that. Here we discuss the results of your tests or the results of others, that you believe in, and that prove your position. They measured this re-radiation from CO2 as it bounced back to earth from the moon. So the direction was sun-earth (day)-moon(unlit by sun) -earth (night). Follow the green line in fig. 6, bottom. Note that it already starts at 1.2 um, then one peak at 1.4 um, then various peaks at 1.6 um and 3 big peaks at 2 um. You can see that it all comes back to us via the moon in fig. 6 top & fig. 7. Note that even methane cools the atmosphere by re-radiating in the 2.2 to 2.4 um range. There are other papers that I can look for again that will show that there are also absorptions of CO2 at between 0.18 and 0.135 um and between 0.125 and 0.12 um. We already know from the normal IR spectra that CO2 has big absorption between 4 and 5 um. So, to sum it up, we know that CO2 has absorption in the 14-16 um range causing some warming (by re-radiating earthshine) but as shown and proved above it also has a number of absorptions in the 0-5 um range causing cooling (by re-radiating sunshine). This cooling happens at all levels where the sunshine hits on the carbon dioxide same as the earthshine. The way from the bottom to the top is the same as from top to the bottom. So, my question is: how much cooling and how much warming is caused by the CO2? How was the experiment done to determine this and where are the test results? (I am afraid that simple heat retention testing – like the closed box experimenst – do not work here, we have to use real sunshine and real earthshine to determine the effect in W/m3 / [0.03%- 0.06%]CO2/m2/24hours). I am doubtful of the analysis of the spectral data. I have not seen any work that convinces me. In the case of CO2, I think the actual heat caused by the sun’s IR at 4-5 could be underestimated, i.e. the radiation of the sun between 4 and 5 may be only 1% of its total energy output, but how many Watts per m2 does it cause on earth? Here in Africa you cannot stand in the sun for longer than 10 minutes, just because of the heat (infra-red) of the sun on your skin. CO2 also causes cooling by taking part in the life cycle. It is a process called photo synthesis. It provides for our food and all the (coloured) liquids that we drink. Plants and trees need warmth and CO2 to grow – which is why you don’t see trees at high latitudes and – altitudes. The process is endothermic, and it appears no one has any figures on how much this cooling effect (of CO2) might be. There is clear evidence that there has been a big increase in greenery on earth in the past 4 decades. So, where are your results on that amount of cooling caused by the CO2? I don’t know. You tell me, JOHN!! Bring it on!! The above results show that it has been cooling since 1994. So, John, sorry, according to me, there is no AGW except due to the (more) snow that you might be having to move away next winter. The earth radiates energy to space from all levels of the atmosphere including the surface. In the upper (drier) layers of the atmosphere energy is radiated mainly from CO2 molecules. We can see this from emission spectra observed from orbiting satellites. As more CO2 accumulates in the atmosphere – particularly in those upper layers – the average height at which energy is emitted increases. This means energy is emitted from colder layers (i.e. higher -> colder) which, in turn, means that the rate of emission decreases ( a consequence of the Stefan-Boltzmann Law). Now we have an imbalance where the amount of energy entering the earth’s climate system is greater than the amount leaving. Basic Thermodynamics tells us that this will result in warming. Warming will continue until the incoming/outgoing energy balance is restored. I don’t make any claims about how much warming will occur. I doubt the more extreme claims are correct, but I have no doubt that an increase in atmospheric CO2 will make the planet warmer than it would otherwise be. A temperature rise of around 1 deg C (as predicted by various radiative transfer models) looks to be about right. …., means that the rate of emission decreases ( a consequence of the Stefan-Boltzmann Law). Now we have an imbalance where the amount of energy entering the earth’s climate system is greater than the amount leaving. /and how does this balance against your claimed warming due to (more) CO2 14-16 um? In the right dimensions please: – time is important since we only have 12 hours sunlight per day and 24 hours earthshine per day. If you can find me the correct results that prove that there is more warming, you must be a genius. I could not find them. The nature of past global warming- and current global cooling rates is that of a parabolic curve, suggesting a natural process. Obviously the actual “global” cooling is still so little as to go largely unnoticed: it is only about 0.2 degees K since 2000, which probably falls within the error of normal thermometers. I get that global warming started somewhere in 1945 and global cooling started in 1995. That is a cycle of 50 years. Does that ring a bell somewhere? There is very likely an ozone connection. All the African light heats your skin. The IR portion merely heats; the shorter wave stuff heats and illuminates, because it is more energetic and can do two things at once. That is true. You found an error somewhere, from me? and that is when the UV really hits you but you only realize you are burnt when it is too late. speaking of UV, it seems that melanin (dark skin) reflects UV strongly. Black African skin is thus white or silvery in UV illumination, whereas pale white skin absorbs UV, and hence appears black. What did you think of my apparent discovery of a 50 year cooling and a 50 year warming cycle? Any and every cycle found slashes away at the supposed CO2-dominance meme. Though I’ve actually encountered the defense that they all ended when CO2 took over in the ’50s! !